Exegeting a text—burrowing deep into its history, language, and literary structure—is an indispensable skill for any serious student of the Bible. Given their theological richness and poetic power, the prophetic texts of the Hebrew Bible would seem to be prime candidates for exegetical examination, but they often pose difficulty. In this book, James Nogalski offers solid, practical guidance on how to read and exegete a prophetic text in its literary, historical, and conceptual contexts. Assuming no prior knowledge of Hebrew, Nogalski devises an exegetical method that focuses on the distinctive elements of prophetic literature, rather than on the narrative material one finds in practically all introductions to exegesis. He provides clear examples for understanding poetic texts, prophetic genres, changing voices, and other important aspects of these texts. This book offers essential tools to help readers navigate the particular challenges and opportunities of interpreting the prophets. "Jim Nogalski has produced a tremendously useful exegetical primer for the prophetic books of the Bible (rather than yet another summary of their contents). There is nothing else like it currently in print. Concisely and judiciously, he treats prophetic speech formulas, parallelism, key terms, symbolic acts, literary forms, syntactical connectors, catchwords and major themes. He pays particular attention to the basic challenge of identifying speaker, addressee and context, especially in translation, and provides well-chosen examples. I recommend his book for any introductory course on the Prophets." "Seminary students, professors, and interested lay persons will thank Nogalski profusely for this clear and concise demystification of the terms, tools, and techniques utilized by biblical scholars. He provides more than a mere glossary of terms, demonstrating instead the use and usefulness of virtually the complete arsenal available to a student of Israel's prophetic literature. Most importantly, he makes this demonstration with a view toward the ultimate objective of a theological reading of the prophets, namely, the final step of hearing them in the context of a contemporary life of faith within a community of faith." "Nogalski's book is the product of years of practical teaching experience, as well as scholarly reflection upon these ancient texts. 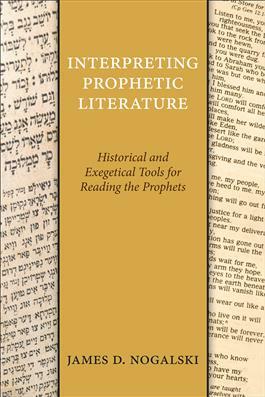 Students coming to the exegesis of prophetic literature for the first time will find here a wealth of useful and immediately applicable information concerning how prophetic literature works, from its characteristic compositional elements to its historical settings, collection, and editing."